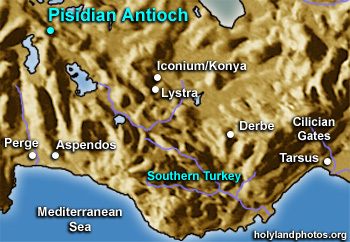 The site of ancient Pisidian Antioch is located on the outskirts of the Turkish town of Yalvac (population 43,345 - 2002). It is located on the western slopes of the Sultan Dag mountains which form the western boundary of the high central Anatolian plateau at an elevation of 4055 ft. [1236 m.]. Roads from the central plateau funnel past this site and from here they basically head west 128 mi. [206 km.] to Laodicea ad Lycum from where they radiate out to various coastal cities. Paul and Barnabas visited the city on their first missionary journey (Acts 13:13–50; 14:22). They reached the city traveling by foot from Perge some 155 mi. [246 km.] to the south. They probably came to the city due to a recommendation of Sergius Paulus, the proconsul of Cyprus who had previously been converted. It is probable that Sergius Paulus had estates and relatives here in Pisidian Antioch and he had probably sent a letter of introduction with Paul and Barnabas. Here at Pisidian Antioch Luke records a lengthy excerpt of the Paul's sermon given in the synagogue (Acts 13:16–41). In it Paul describes how Jesus of Nazareth is the fulfillment of Old Testament prophecies and the witnessing pattern that Paul was to follow on his journeys — to the Jews first and then to the Gentiles (13:46–47) — was established. Paul and Barnabas had to leave town because of the opposition, but later returned to it at the end of this journey. Paul probably revisited the city on both his second and third journeys as he passed from east to west through this region. Indeed, the book of Galatians was written to churches in this region. The city was established in the fourth or early third century B.C. It was designated as a Roman colony by the emperor Augustus in 25 B.C. Much building activity took place between 15 B.C. and A.D. 30 — just prior to Paul's visit about A.D. 46 or 47. Excavated remains include a monumental gate, streets, a small theater, a Temple to Augustus, a bath, a nymphaeum, and a church dedicated to St. Paul. The excavators include Stephen Mitchell and especially the caring work of Mehmet Taslialan. Please be sure and also view the "Sergius Paulus Inscription."